Skin cancer is the most commonly occurring cancer, affecting more people in America than breast, prostate, lung, and colon cancers combined. While each patient is unique, there is currently a 93 percent survival rate for skin cancer, which is one of the highest survival rates of any cancer. This is due to a number of factors, the most important being early detection. Catching any cancer in its early stages is one of the main keys to surviving it. 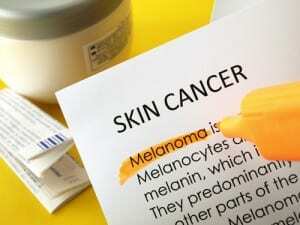 Educating yourself on what skin cancer and precancerous lesions look like will help you know when you should get evaluated for skin cancer. The ABCDE system of identifying cancerous and precancerous lesions will help you know if you should get your lesion checked for skin cancer. A: Asymmetry – Cancerous lesions are not symmetrical. If you draw a line through the center of the lesion, both sides don’t match up. B: Borders – Regular lesions have smooth borders, while cancerous and precancerous ones have jagged, irregularly shaped borders. C: Color – Most benign moles are one color. If you have a lesion that varies in color, you should get it evaluated. D: Diameter – Cancerous lesions are usually larger than benign lesions. You should get checked if your lesion has a diameter larger than 6mm or if it is bigger than an eraser head. E: Evolving – Moles and other lesions usually stay static. If yours changes in appearance or grows over time, you should have a doctor check it out. If you believe that you might have a cancerous lesion, it is important to schedule a consultation with a doctor. During your consultation, a small portion of the lesion will be cut off and sent to a lab to be biopsied. If your results come back as precancerous or cancerous, the next step to take is treatment. Whether you have a precancerous or cancerous lesion, the first step is removing the mass. Smaller lesions can be removed in-office using local anesthesia. Common removal techniques include excision or desiccation. After removal, some patients may require further cancer treatment that may include chemotherapy and radiation. If you need to have a lesion tested for cancer, need a lesion removed, or need reconstruction after treatment, schedule your consultation with Dr. Wald today. Contact our office at (714) 312-3549 or fill out our online contact form here for additional information. This entry was posted on Tuesday, October 27th, 2015 at 4:49 pm	and is filed under Skin Cancer Information, Skin Cancer Treatment, Skin Care.